farmers as well as 4-H & FFA members who show or sell these projects should strongly consider becoming certified. In 2019, some of America’s largest meat distributers will only buy beef that is from BQA Certified producers. This certification is not mandated by law. However, it is being required by some of the links that make up the beef supply chain, including auction barns, feed lots, packers, retailers, and consumers. Essentially, marketing beef without BQA certification will become increasingly difficult and those who do so successfully may find their compensation inadequate. The February 2, Greene County training will certify participants for three years. This opportunity is for any beef or dairy cattle producer in Greene County or surrounding area at $10 per person to cover educational materials. Additionally, Greene County 4-H and FFA members exhibiting beef or dairy market animals are strongly encouraged to attend for no charge. This will also cover their annual requirement for Quality Assurance for 2019. Special thank you to Greene County Cattlemen’s for providing lunch for the program. Also, a session for the annual Quality Assurance for 4-H and FFA members will be held on February 2 starting at 10 a.m. at the OSU Extension office. This is for anyone showing livestock market projects at Fair that require Quality Assurance annually. Additional opportunities to complete annual Quality Assurance for youth will be on March 25 at 10 a.m., March 27 at 6 p.m., and May 8 during a Goat Clinic. More details on these additional opportunities are forthcoming. Visit greene.osu.edu to more details and to register for these upcoming programs. 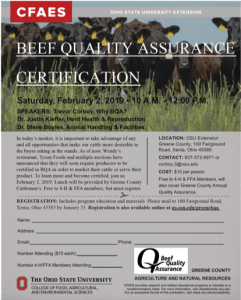 Questions on Beef Quality Assurance can be directed to OSU Extension Greene County, Trevor Corboy, Agriculture and Natural Resources Educator at 937-372-9971 ext. 114 or corboy.3@osu.edu. Further, annual 4-H & FFA youth Quality Assurance questions may be directed to 4-H Youth Development Educator, Rebecca Supinger at supinger.5@osu.edu. With significantly cooler temperatures upon us throughout Ohio, this week Mark Sulc shares concerns for the forage species that can be extremely toxic soon after a frost or freeze. Rain makes grain . . . and LOTS of weeds too! This week Christine Gelley and Clifton Martin talk about a relatively new weed that’s invading eastern Ohio pastures – spotted knapweed. Spotted Knapweed; a weed quickly becoming a growing concern! It’s been 10 years since Ohio’s fence laws were updated, and yet today there remains confusion among some on how to interpret them. This week Christine Gelley clarifies many of the questions, and offers resources to explain the rest. This week’s letter focuses on the beef cattle market . . . what’s happened, what’s happening, and what’s expected to happen for the balance of the year. Quality stored forages are already hard to come by in parts of Ohio this year. One of the quickest ways to reduce the need is to eliminate those cows that are open. This week we talk about culling, as well as adding value to those culls. State wide, few springs have been as challenging as this one for getting quality forages harvested in a timely fashion. Now that first cutting might finally be concluded – in many parts of Ohio, just within the past week – the challenge of finding a way to feed it effectively commences. This week Mark Landefeld addresses the situation. You Finally Got the Hay Made, How Good is It? As the saying goes, “if it was easy, everyone would be doing it.” Thus far this year very little related to anything that’s grown or raised outdoors has been easy. This week we focus on alternatives for dealing with many of the feed related challenges we’ve enjoyed to this point in 2018. When Rain Wrecks Your Pasture Plan! Late spring + above normal frequency of rainfall + above normal May temperature has the potential to be a disaster for cattlemen that depend on hay for quality winter feed. This week Chris Penrose and Dan Lima discuss what can happen when hay is baled at greater than optimum moisture levels, or the resulting quality if harvest is delayed.. Mother Nature has offered some unique challenges this spring, none the least of which is pasture and hay management. That’s a focus of this week’s articles.